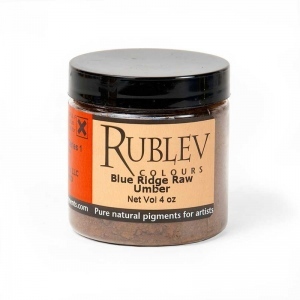 Details Our Blue Ridge Raw Umber is a fine, brown powdered pigment from Virginia, USA. Umbers are mineral pigments that can be used in all mediums, such as tempera, oil and watercolor, and are obtained from natural earths colored by the oxides of iron and manganese. 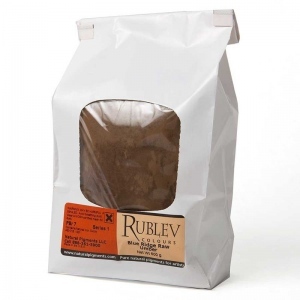 Our umber from deposits in the Blue Ridge Mountains of Virginia, USA is finely ground and exhibits a yellow brown masstone with warm undertones. It has excellent tinting strength and good covering power. Umber absorbs a moderately high amount of oil when dispersing it in this medium. The oil absorption ratio is 45–55 parts by weight of linseed oil to 100 parts by weight of pigment. If the measurement were grams, umber would require 45 to 55 grams of linseed oil to grind 100 grams of pigment to form a stiff paste. Due to its manganese content, umber hastens the drying of oil, and forms a good, flexible film.